Most of us are aware that we don’t have any original texts of the books of the bible. The reason is in how the Bible was copied and transmitted through the ages. The books were hand written and copied throughout the ages until the printing press was invented. As you might expect there were errors in this process. The above is an example of an Uncial text which was the method used from the third century B.C. to the tenth Century A.D.[ii] Notice that it has a string of one block Greek letter after another. This is called scriptia continua, continuous letters with no spaces between words or sentences. Later manuscripts, starting around the eighth century, are called miniscules, which had a cursive running style. About the same time as the appearance of miniscules we find punctuation starting to be added. Heading and titles were first added by Stephan Langton into the Latin Bible about the beginning of the thirteenth century. All of these “improvements” allow for the possibility of interpretative error, as scribes and especially translators depended on their theology for understanding the text they were copying or translating. In terms of translation remember that there is no such thing as a word for word translation. In Greek, for example, we have three words for love: phileo, eros, and agapao, all translated into the English word love. Translations are by nature an approximation of the meaning of the original text rather than an exact meaning of it. It is estimated that there are hundreds of thousands of differences between the thousands of manuscripts from which we get the Bible. Most of the mistakes are harmless typos. Some, however, are more serious, and there are even apparent forgeries. We will look at some apparent forgeries in a later article. As manuscripts wore out they were replaced with copies, some from the same manuscript, others from perhaps an earlier version. In any event, it becomes easy to see why by the time modern bible versions were being translated it was from copies of copies of copies. The above page does not show an unusual amount of variation, which you can see is substantial. There are numerous variations in just about every chapter. 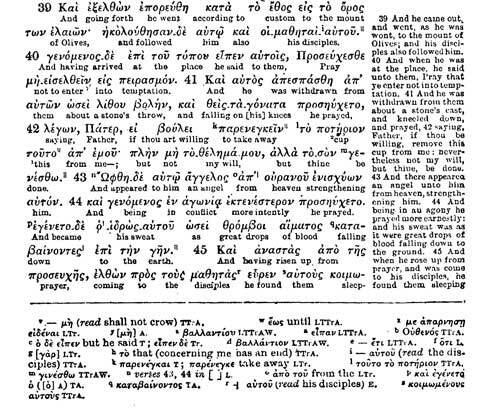 As an example, if you look at the beginning of verse 43 above (in the image of the Interlinear text) you will see an “n”. In the notes below, it reads, “nverses 43, 44 in [ ] L”. This means that verses 43 and 44 are missing in the Lachman text. Some scholars believe that since these verses describe Jesus “sweating blood” making Jesus look weak and out of control (in some people’s opinion) which is inconsistent with other passages describing him in the Gospels, some scribes omitted them. This is an example of scribes changing the text for doctrinal reasons.